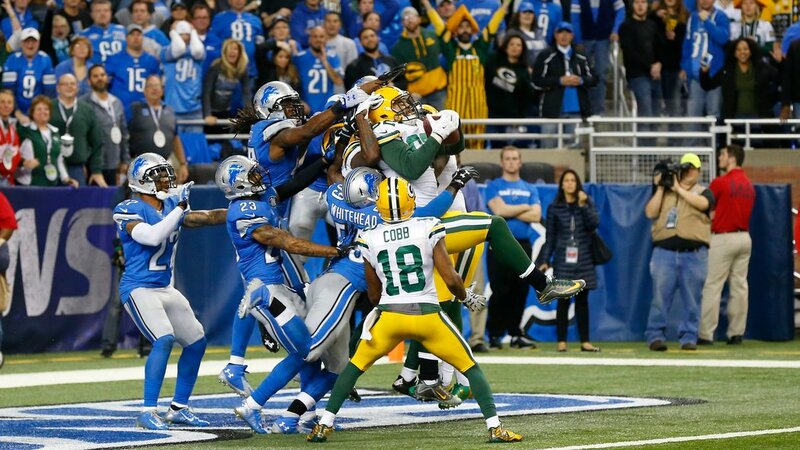 The Packers’ Richard Rogers (82) caught the game-winning touchdown pass Thursday night against the Lions. A desperation play by the Packers involving a completion and two laterals ended when quarterback Aaron Rodgers was brought down by Devin Taylor with no time on the clock. The Lions had seemingly upset Green Bay in Detroit, 23-21, for their first sweep of their old rival since 1991. But there was a flag. Taylor was called for a face mask on Rodgers. Most of the Lions disagreed. “My personal opinion, I don’t think I did,” Taylor told The Detroit Free Press after the game. Replays showed contact between thumb and the mask, though Taylor did not seem to grab hold of it.